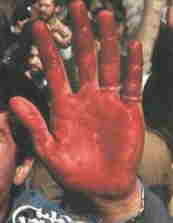 The treatment of Arash Nassouri was brutal. "They hung me upside down and handcuffed me with a bar under my knees," he says. "They started kicking and punching me ... beating me in every part of my back, my stomach, face, everywhere. My backbone was broken. But the pain was worst when they hit my face. My nose was already broken, my teeth were broken. Every time they hit my face there was a lot of pain. I was ready to say anything." Mr Nassouri still walks with a profound limp, and is awaiting his second operation to mend a seriously injured back, which is the legacy of his torture. Six years after his horrific ordeal, he still takes nine different tablets a day to treat pain and depression. Now 33, Mr Nassouri, who has gained political asylum in Britain, still attends weekly counselling sessions to try to come to terms with the experience he says ruined his life. The British Government is adamant that torture is never justified. In its recently published report on human rights, it said "torture is abhorrent and illegal and the UK is opposed to the use of torture under all circumstances." So it is surprising that the Government has argued for the admissibility of evidence in UK courts which has been extracted under torture abroad. The UK's ambassador to Uzbekistan, Craig Murray, was dismissed after he spoke out publicly about the authorities' routine use of torture, including, allegedly, boiling people to death. The decision, upheld by the appeal court, is to be appealed against again to the House of Lords by human rights lawyers who argue it in effect condones use of torture by foreign powers. Amnesty International has accused the Government of "giving a green light to torturers" by supporting the admission of such testimony. While the Medical Foundation for the Care of Victims of Torture, where Mr Nassouri is being treated, said using testimony obtained in foreign torture chambers was not only tainted but unreliable. "Why should you believe somebody who has told you something because he was in such pain? He just wants the pain to stop," said Sherman Carroll, director of public affairs. "If you permit such testimony to be used in UK courts you are encouraging torture to be used." While a 27-year-old civil engineering student, and active in university politics, Mr Nassouri was seized and taken blindfolded to an unknown location in Tehran by members of the official security services. He was tortured by interrogators who accused him of being a member of the mujahedin and of plotting against the Islamic regime. "When I was on the floor, I asked him (the interrogator) to wipe the blood because I could feel the blood in my mouth. My tongue was touching broken teeth. My head was throbbing with pain and I could feel my eyes swell up. I could feel my nose was broken. The interrogator said I should not be worried about my vanity because people had go to war defending collaborators like me," he said. Tears come to his eyes as he slowly and methodically recounts the torture sessions he endured, along with threats against his wife and family. "I was taken into a room blindfolded. The interrogator was called Sayed. He said, 'we know everything about you. Tell us everything about your group and your contacts and who is funding you.' But I had not done anything that was wrong. Our group was not illegal. I was not anti the regime. I was in favour of reform," he says. "Later they said they had arrested my wife as well and she was being treated in the same way." He puts his hands beneath his knees as he demonstrates how he was held in the "juojeh kebab", a notorious torture technique, where he was handcuffed in a crouching position and hung from the ceiling upside down before being beaten. "They told me to sit on the floor and they brought a metal bar. They put it through the handcuffs under my knees," he said. "I was hanging from the bar and they started to beat me." The group he was a member of was a pro-democracy opposition group, which sought reform of the Islamic system. They held debates and meetings and distributed leaflets. "We hadn't done anything illegal. We criticised Islamic punishment and reforms to the judicial system," he said. In 1998, he was summoned by the headof the university,who told him the intelligence services wanted to interview him. "I said, 'OK, I haven't done anything wrong, I will talk to them. I was afraid at first but I thought I would be safe because the head of the university was aware of it," he said. "I got into a car and I was blindfolded. Before I was blindfolded I noticed that the car doors had no inside handles." That was the beginning of a terrifying ordeal, in which Mr Nassouri was accused of being a collaborator and a saboteur along with other torture victims whom he heard calling from other "cells". The beatings were designed to make him confess to crimes that he had not committed. The "confession" led to several months' detention in two Iranian prisons and a suspended seven-year prison term. A raid by the security services, convinced him his life was in danger, so he paid traffickers to smuggle him out of Iran.